They say location is a key factor when buying a new home – and that’s ultimately why Mr and Mrs Hewitt chose this beautiful stone-built home in the rural village of West Bradford, near Clitheroe, in the heart of the Ribble Valley. But the old kitchen in this beautiful countryside home simply didn’t do it justice. It was very plain and ordinary and didn’t give the wow factor the Hewitt’s were looking for. Although it had spectacular views over the beautiful Lancashire countryside, the two designers recognised how much potential the kitchen had. So Mrs and Mrs Hewitt set out to find a company that could help them add their own personality to the room. 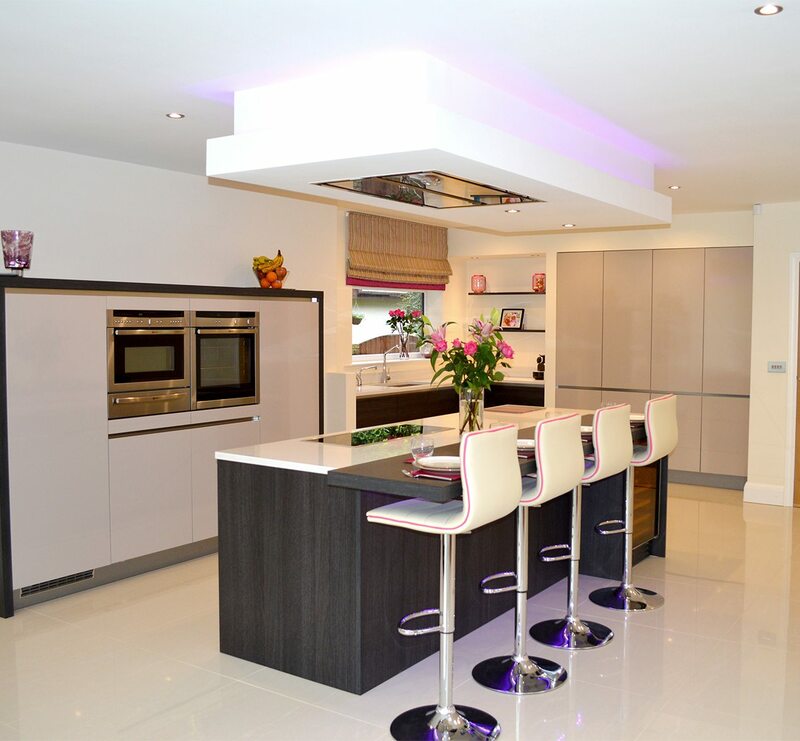 It was the cutting-edge designs shown on Kitchen Design Centre’s website that finally swayed their decision to go and visit the Blackburn showroom and talk to kitchen designer Will Hustler. To make the most out of their country views, Helen and Peter considered building an extension. The kitchen represented quite a challenge for the designer, since it was square with doors in each corner and was difficult to work with. “We were given artistic licence which allowed us to come up with a design that was very difficult,” said Will. 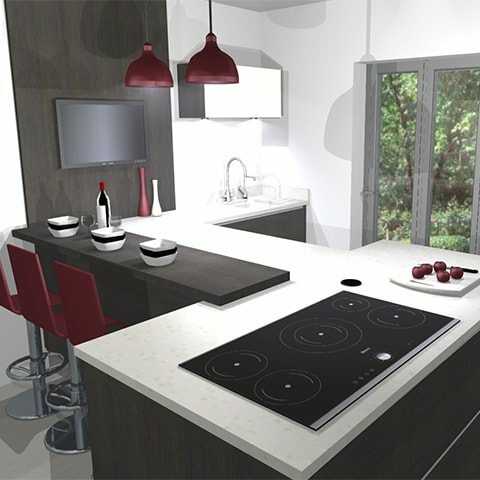 The new designer kitchen was cleverly designed with an island unit, a T-section and breakfast bar, which was located in a place which took full advantage of the beautiful views. 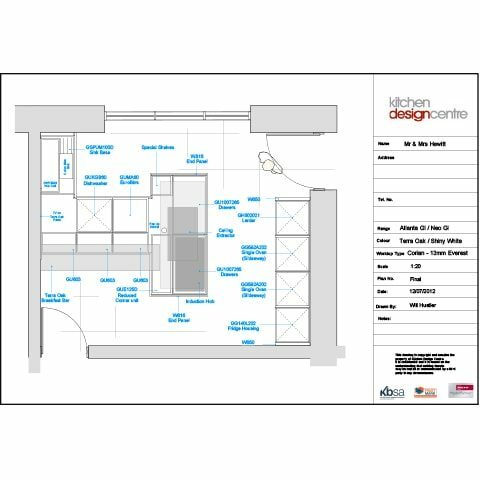 Will said: “When I presented the plans to them, they loved them instantly! 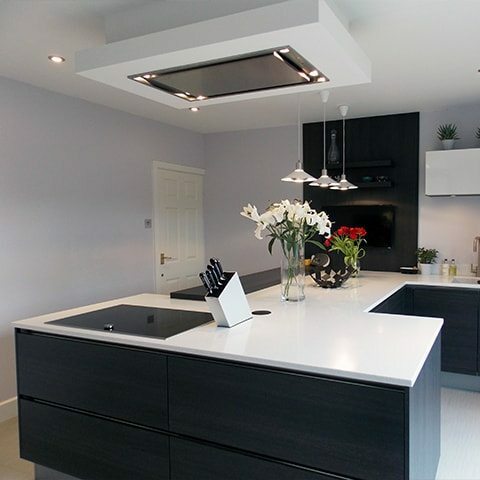 “Barely anything was altered, just a few tweaks here and there – it went down like a dream.” Helen decided to go for Terra Oak Hacker German units, mixed with gloss white and slim, streamlined Corian worktops. Will recommended the state-of-the-art appliances from Neff as well as the gloss white utility room, giving it a fresh, bright look. 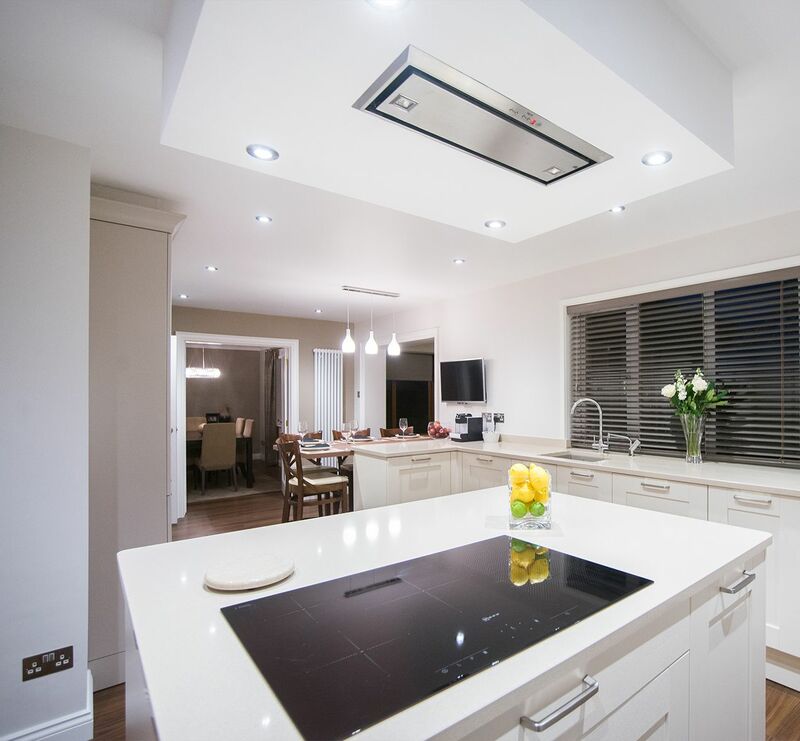 The kitchen was completed using Mr and Mrs Hewitt own builders, who did the windows and doors to match the rest of their home. Helen said: “My husband and I are both designers by trade so we are extremely fussy and we always know exactly what we want to achieve when we embark upon a project. “We wanted our kitchen to have visual impact as well as it being a working space but we didn’t want a ‘units on a wall’ type of kitchen. We were very clear that we wanted to maxmise the middle of the kitchen but not have the standard island that seems to be the norm! 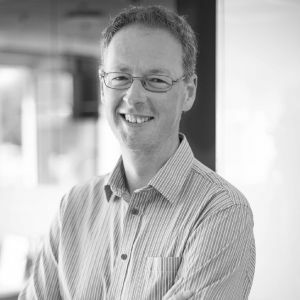 “Will understood the brief and designed a space that was both functional and had the visual impact we wanted. The whole process has been stress free, delivered on time and, dare I say, to budget! "We have exactly what we want, a stunning space to be proud of. The quality of the fitting service and the overall customer care has been top class." "We were given artistic licence which allowed us to come up with a design that was very difficult, Helen is very design-led and she knew exactly how she wanted her kitchen to look so she was very easy to work with."